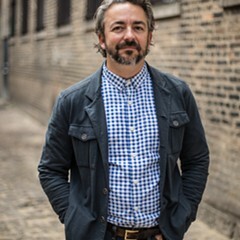 You've probably seen the news all over fall roundup and coming-soon restaurant pieces: Matthias Merges, who in the last two years has opened Logan Square hot spots Yusho (technically Avondale, but close enough) and Billy Sunday, will launch a second front in Hyde Park with the opening of A10 next month, to be followed around the end of the year by a second Yusho. The original announcement of this project followed on earlier news that the Longman & Eagle team (or some variant thereof) was also planning to jump from Logan Square to Hyde Park for the Promontory (though that project has since gone rather quiet as other projects of theirs, such as Parson's Chicken & Fish, have dominated attention). Did Logan Square just have a collective brain-meld that Hyde Park was the next thing? Hardly; both sets of restaurateurs were wooed by the University of Chicago, which is heavily involved in developing retail on 53rd Street near the university and trying to improve the area's restaurant scene, with its sometimes likable, but decidedly trapped-in-a-70s-college-town vibe. Even if it means, basically, transplanting Logan Square to Hyde Park like they're picking up a colony from Earth and dropping it on the moon. (It also meant ramming through a vote to make liquor sales legal after it was belatedly discovered that the precinct was dry.) Using restaurants as a tool of social engineering is hardly unusual—it's part of any retail development—but we don't often see someone shopping one part of town to create an instant hipster neighborhood somewhere else on quite this scale. I spoke with Merges recently about how he and his architect wife, Rachel Crowl, got involved with the project, and how A10's concept of simply prepared European dishes grew out of the space they were offered. John Vermiglio, who also created the menu at Billy Sunday, will be A10's chef when it opens next month. Michael Gebert: So how did these projects come about? You were approached by the University of Chicago? Matthias Merges: Yep! We were indeed. What did they say, just "Hey, we hear Yusho is good and we wish we had one?" Yeah, pretty much. The back story with Hyde Park is, my father's a graduate of the University of Chicago, my father-in-law was a graduate and taught there, had a relationship with the Divinity School. So we have history there. My in-laws have lived down there for years, and we've always said to ourselves, wouldn't it be great to open a restaurant down here someday? But Hyde Park is a very particular spot. There's no infrastructure, there's no soft retail for people to stay in Hyde Park—they always go to the South Loop to shop, to get their groceries, to dine, whatever. And the university decided, the only way they're going to compete with the Harvards or the Stanfords or the Princetons is that they have to create this density within Hyde Park where people will stay there. So when they approached us, I was like, whatever, here's more real estate people coming up saying, "Wouldn't it be great for you to have a restaurant in Oak Park?" But as we did our due diligence, we found out that it was a serious project. A Whole Foods. An 18-story office tower moving all the administration over to 53rd street. There's almost a billion dollars on the table that they're going to put into Hyde Park. And at that point the momentum, the infrastructure, the larger grocery stores and soft retail were coming in and making the commitments, so we thought it was an appropriate time to make the move to Hyde Park. What was the process for you that led to A10 being a European concept? First we went through all their real estate and looked for a space that felt good. And we landed on the Harper Court building, right next to the theater, so at 53rd and Harper Court. We have the corner spot, and it's like a historic, turn-of-the-century space that really spoke to us. We walked in and it reminded us of France, and Italy, with the mosaic floors, with the plaster walls, with the high ceilings and the grand entrance. We said, this could not be more perfect for doing what we want to do. 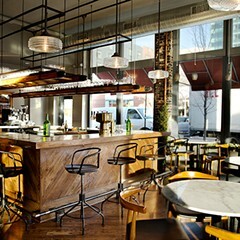 We have enough outdoor seating to do what you see in France, with the 70 seats outside. We had all those things, and it just made sense at that point to put that kind of, I guess, vision into the space. So they weren't just throwing you out on the frontier and saying "Hey, make this area popular for us, would you?" No, no. That would be a little—it would be way too risky for us. It's one of the tragedies of Hyde Park that you look back—we did a lot of research into the history—and it was the hottest place to be. Everyone was there. And we said to ourselves, this place is so beautiful—there's so much historic architecture, there's such a great population there. One thing I didn't know is, per capita, there's more money in Hyde Park than in Evanston. And the more we dug in, we thought that handmade, market-driven, simply made and delicious food at a reasonable price with great service, this could really change the dynamic down there. So why do you think they approached you, as opposed to somebody else with a hot restaurant at the moment? I don't know! I'm not quite sure. 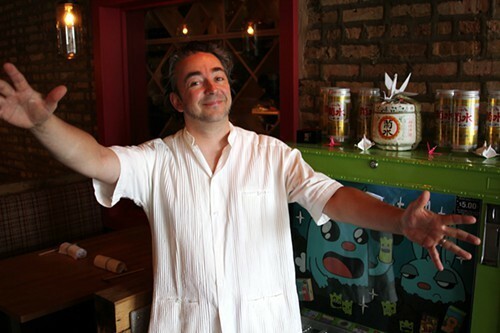 I think it might have been the history of where I came from before this [Charlie Trotter's], and Yusho came out on fire, it showed that we could do something creative and run a successful business, and do it at a very approachable level. I think if I was doing fine dining, there's no way that they would have approached us. There's a whole lot of economics behind it, but we were able to show that we could . . . we're not building a five-million-dollar restaurant. We came with a good infrastructure package, my wife's firm, she does all the [general contractor] work. We come to the table with an economy that others can't. There's a lot of good food in the city right now that's approachable [in price]. It has risen the game substantially in the past five or ten years. For us, Hyde Park is the next frontier on that end. Kind of reminds me of Logan Square, really.